When you can almost feel the warmth of the hearth and hear the fife and drum… you know you have arrived to Kingston’s Senate House! The Senate House’s “in the moment” colonial lead tours transports museumgoers into another time and place. The first New York State Senate met here in September and October 1777 when the building was the home of Abraham Van Gaasbeek. Built in 1676, it is the oldest public building in America. Descendants of the original builder, Wessel ten Broeck, occupied the residence until they deeded it to New York State in 1888. 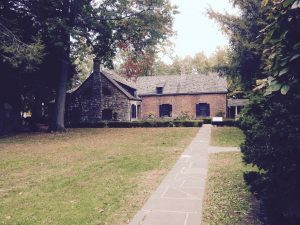 The museum holds many stories and histories that tell of Dutch Settlement, Colonial America, The Revolutionary War and The Burning Of Kingston. What about the celebs?!! The adjacent museum, built in 1927, contains the largest collection of John Vanderlyn paintings, drawings and papers in the country.